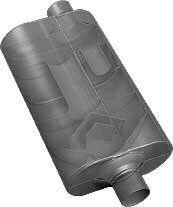 This Super 50 Series Delta Flow muffler incorporates an increased case size with innovative technology found in the 50 Series Delta Flow muffler. The Super 50 Series allows for optimum exhaust flow, increased mileage and reduced interior resonance. This muffler is especially suited for trucks, SUVs and cars with large displacemnet high performance engines. This version of the Super 50 Series muffler features a special tuning chamber which reduces interior resonance.